Hutchinson, Kansas isn’t the kind of place you’d wind up if you weren’t looking to. The placid prairie town sits a solid hour’s drive south of I-70, the interstate that most travelers use to blow across 425 miles of Kansas cornfield and cattle pasture as quickly as possible. But as soon as I entered the silver-roofed museum, which is flanked by an authentic Mercury-Redstone Launch Vehicle and a Gemini-Titan II rocket, I knew the extra hours of driving were going to be worth it. After all, how often is one greeted at the door by a Blackbird spy plane? For fans of spaceflight, military history, and standing awestruck next to the most powerful flying machines ever built, the Cosmosphere, home to the largest international collection of Cold War space artifacts on the planet, just gets better from there. The museum’s expansive entryway not only houses a flown SR-71 Blackbird from 1966—the year the famous spy plane officially joined the US Air Force—but also a scale replica of the Space Shuttle Endeavor, and the twisted remains of an engine thrust chamber from the Saturn V rocket that launched the Apollo 11 astronauts to the Moon. Oh, and a planetarium, and a live rocket science demonstration lab. It’s Disney World for space nerds before you’ve even hit the main exhibits. With an eight hour drive to the Rocky Mountains ahead of me, I decided to forgo that afternoon’s planetarium show—a documentary on black holes narrated by Liam Neeson—and head straight downstairs to the Hall of Space Museum, which kicks off its tour of space history right at the beginning, in the clandestine laboratories of the Third Reich. In the age of commercial space tourism and missions to Pluto, it’s easy to forget that humanity’s interest in the final frontier sprung out of a desire to kill one another. 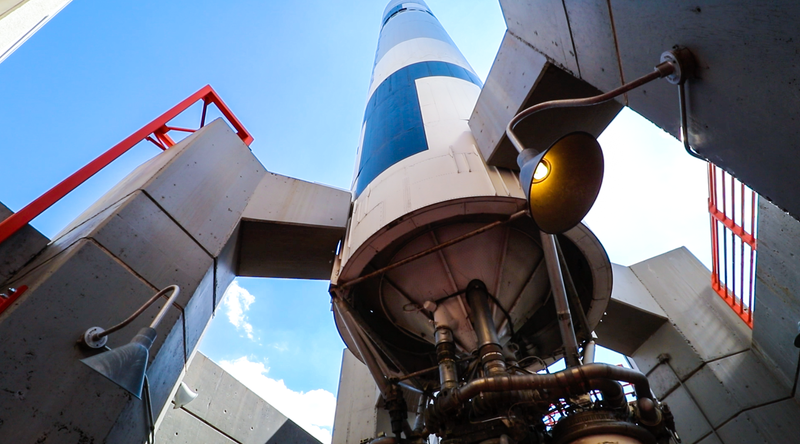 At the Cosmosphere, you’ll become palpably aware of that fact as you’re walked through the history of Nazi Germany’s infamous “vengeance weapons,” the V1 and V2 rockets. It was these fast-flying missiles, developed to terrorize cities like London, that laid the groundwork for future space travel, including rockets that sent humans to the Moon. Rockets weren’t enough to win Nazi Germany the war, but in the years after the Axis powers surrendered, aerospace technology continued to leap forward. From the dust of World War II, the museum launches visitors into the Cold War, where once again, a need to project military might spurred innovation in rockets, satellites, and eventually, human spaceflight. A flight-ready backup of Sputnik 1—the Soviet satellite that became the first to reach orbit, demoralizing Americans and kickstarting the decades-long Space Race—features prominently, alongside an engineering model of Sputnik 2, the second spacecraft into orbit and the first to carry a living creature, the famous space dog Laika. Of course, the United States didn’t stay beat for long. The collection is replete with early American space age innovation, including a replica of the Bell X-1 rocket plane, the first manned airplane to break the sound barrier, and the Gemini X spacecraft that slingshotted astronauts John Young and Michael Collins around the Earth 43 times in 1966. Having often considered the risk that modern astronauts take on by venturing off Earth inside giant metal tubes of fire, a glimpse of the cramped, primitive capsules the first space pioneers willingly climbed into to bring glory to their countries made my skin crawl. The Cosmosphere was founded as a small planetarium in 1962, by lifelong space enthusiast Patty Carey, who grew up in Oklahoma city before marrying and moving to her husband’s home town of Hutchinson. Feeling that the central US had a distinct lack of spaceflight-themed entertainment options, she repurposed the poultry building on Hutchinson’s state fair grounds to share her love of the stars with the community. By 1966, it had gained popularity, and moved into its present location, on the grounds of Hutchinson Community College, where it became one of the first planetariums associated with a community college in the nation. Eventually, through partnerships with the Smithsonian Air and Space Museum and NASA, the Cosmosphere was able to acquire several thousand space artifacts in the late 1970s, enough to launch a museum. In the 1980s, it began acquiring Soviet artifacts too, putting it in a position to tell the story of the space race from both countries’ perspectives. The Cosmosphere has had its share of hiccups over the years, most notably a scandal in the early 2000s in which a former director was indicted on charges of stealing precious artifacts. But today, it appears to be thriving, sustaining itself off ticket sales, restoration and conservation work, and educational programs that see more than 10,000 school kids walk through its doors each year. My only personal complaint with my trip to the Cosmosphere is that I didn’t budget enough time to properly take everything in. Within two hours, I was back in my overheated rental car, sipping a strawberry limeade from the local burger joint and fueling up for a very long drive. I could’ve easily burned an entire day there.